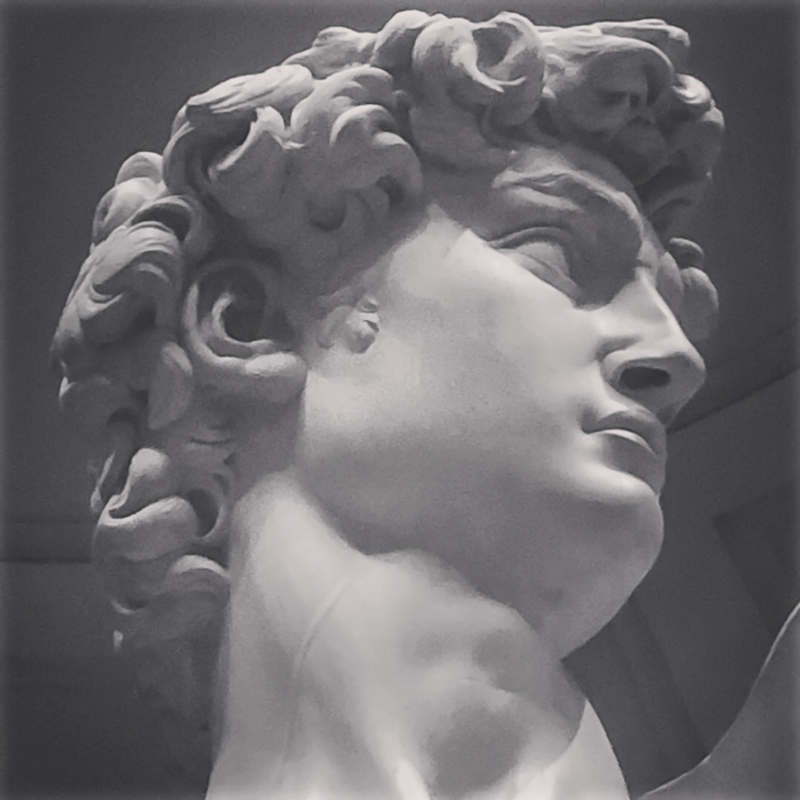 Physician Tobi Amosun takes us along on her recent trip to Florence, where her science knowledge helps us better understand just how magnificent an accomplishment Michelangelo’s David is. I had dreamed for years of going to Italy with friends for my 40th birthday. This past summer, that dream trip happened. I was especially looking forward to seeing the works of Florence’s Renaissance masters in person. In particular, Michelangelo’s David had long been on my bucket list. To someone like me who is now a physician but also earned degrees in art history and biology, Michelangelo’s David is nothing short of genius. In medical school, I spent months dissecting and memorizing cadavers (and smelling like formaldehyde) in the gross anatomy lab. I still remember the silly mnemonics and songs used to commit nerves and muscles to memory. With those thoughts resonating, I knew that the detail and skill required to create this sculpture is astonishing. Outside the Uffizi Gallery, one of the best collections of art in the world, we saw a copy of the original sculpture. In 1873, the real David had been moved to the Galleria dell’Accademia to prevent further effects from acid rain and to prevent further damage (the original had been attacked at least twice). On our last night in Florence, we went to see David. The original David. Michelangelo’s David. As we entered the gallery, the David was at the end of the large main room. It is not an exaggeration to write that I honestly felt my heart start to race. The way it does when I’m about to speak in front of an audience or the way it did when I held my husband’s hand for the first time. Unlike the rest of our group, I almost didn’t want to look at it immediately as the guide explained the history. I could see David out of the corner of my eye but didn’t look. I wanted to wait until the end of the meal to savor the dessert. You only see this sort of genius a few times in your life, and I wanted to crystallize this moment in my mind. So I took my time looking at the other unfinished Michelangelo sculptures and at other paintings in the gallery. Then as I finally drew closer to the David, I was brought to tears by Michelangelo’s attention to the science within his art. He didn’t just create something; he set the David free from the stone. The first thing that grabbed my attention was how large the right hand is in comparison to the rest of the body. The hand has long been my favorite body part because upon dissection, the human hand is just a bunch of interconnected levers and pulleys. I circled the statue slowly, seeing the details that a non-medical person may miss. The extensor digitorum tendons in the hand, the superficial veins in the extremities and neck, the extensor hallucis of the foot, the way the sternocleidomastoid muscle inserts onto manubrium (and you can see the muscle striations), the rectus abdomini, the biceps, triceps, and deltoid. The human body, y’all. It astounds me all the time. And Michelangelo was all of 26 when he carved this. He made David out of the same Carrara marble as my neighbor’s kitchen counters. It is still almost incomprehensible. The David, as a magnificent marriage of science and art, was my highlight of Florence. Travel often surprises me and this experience of seeing the David di Michelangelo was a surprise of the best sort. Dr. Tobi Amosun is a physician working and living in Nashville, Tennessee, who believes that art and science are the same. They are both the human attempt to order chaos. She works with a primarily Spanish-speaking pediatric population and dabbles in writing and public speaking. Her superpowers? Throwing dinner parties and diagnosing rashes. An avid traveler and cook, she lives with her family and dreams of beaches, pasta, and the perfect Sunday. You’ll find her on Instagram at @drbabymamadrama.